The acetabulum is a large cup-shaped hollow cavity for articulation with the head of the femur on the lateral surface of the pelvic bone, where the fusion ilium, pubis, and ischium. A protuberant notch known as Acetabular Notch which is linked by the transverse acetabular ligament and the notch is transformed into Acetabular Foramen and the notch inferiorly indicates the border of the acetabulum. The margins of the acetabulum are attached to the fibrocartilaginous rim along with the acetabular labrum. It is also referred to as the coxal bone or innominate bone. The hip joint created together by the acetabulum and head of the femur. Anterior one-fifth is created by Pubis. Posterior two-fifth is created by Ischium. Superior two-fifth is created by Ilium. A shallow circular depression called the acetabular fossa is located in central and inferior parts of the acetabular floor, it is made by the non-articular part and it has a rough structure. The acetabular notch and the acetabular fossa are continuous with each other. The anterior, superior, as well as posterior borders of the acetabular fossa, are surrounded by the wide articular surface. 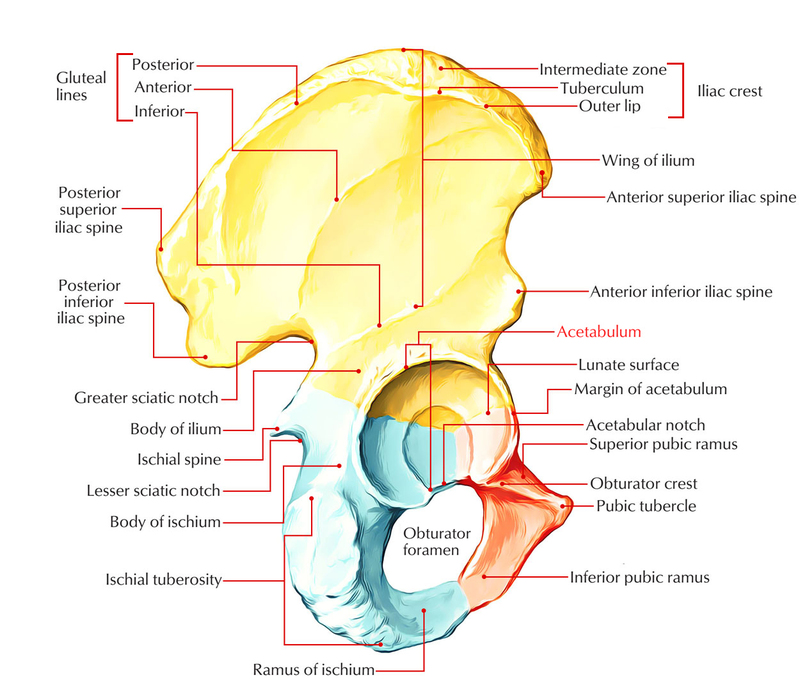 The lunate surface is the smooth crescent-shaped articular surface is located where most of the body’s weight is passed on through the pelvis to the femur and it is widest superiorly. At the acetabular notch, the lunate surface is short inferiorly. The acetabular notch gives passage to blood vessels and nerves, while the ligament of the head of the femur attaches to the acetabular fossa. A layer of hyaline cartilage covers the lunate surface and a pad of fat fills the acetabular fossa. The majority of Fractures of the acetabulum appear whenever the head of the femur is forcefully pushed into the pelvis. Acetabular fracture generally arises as a dashboard injury followed by a fracture of the femur and is mainly caused by an impact to either the sides or front of the knee. These hip socket fractures are rare as they occur much less compared to fractures of the upper femur or femoral head which also called the “ball” portion of the joint. A lot of times patients have other injuries that may require instantaneous treatment. In younger patients Fractures of the acetabulum usually result from a high energy injury like vehicular accident or feet the first fall. In older individuals or those with osteoporosis, a trivial fall may result in acetabular fracture. In a small number of cases, in an older person whose bones are weak, a low-energy incident may create an acetabular fracture such as a fall while standing; it may happen due to osteoporosis or other degenerative diseases of bones. Surgery for restoration of the normal structure of the hip and the hip joint stabilization are frequently the options for treatment of acetabular fractures.